In December 2000, the premiere of El Niño signaled a landmark in John Adams’ artistic evolution. This Nativity oratorio, premiered over the weeks of Christmas at Paris’ Châtelet Theater, conveyed a message of rebirth and hope attuned to what the composer sensed as the mood of the new millennium. Yet the very simplicity of this story of birth and renewal allowed Adams to evoke unsuspected undercurrents of darknessbeneath its reassuring light. Already in that score, juxtaposed against musical imagesof joy and the miraculous, one could hear a threatening note of violence, especiallyin the work’s climactic episode of Herod’s slaughter of the innocents.This strategy of weaving together multiple, at times contradictory, layers of emotionalresonance is even more central to Adams’ new work, The Gospel According to the Other Mary. It is a key to his treatmentof that most archetypal story of Western music and art: the Passion of Jesus. For several years Adams and hislongtime collaborator Peter Sellars contemplated a companion piece to El Niño. Their goal, explains Sellars, was to set the Passion story “in the tradition of sacredart, in the eternal present.” Violence and suffering and transformation are theimportant components of this story, and by drawing on his entire repertoire of experienceas a dramatic composer Adams depicts these with searing humanity. But his unflinching portrayal of the human condition is only part of The Other Mary’s vast spectrum. Operating on twosimultaneous planes – the biblical and the contemporary – his score goes to the heartof its often disturbing subject matter with a keen psychological intuition, particularly in the portrait of the work’s title character.“Of all the arts music is by far the mostpsychologically precise,” Adams has saidabout his work as a composer. “The subtlestharmonic shading or melodic twistcan completely color and influence howthe listener feels about and perceives aperson or event. Music being above andbeyond all things the art of feeling, it is thecomposer’s role to give emotional and psychologicaldepth to a character or a scene.No other art form provides such potenttools.”This is a Passion not only of Jesus, butof a family who loved and were loved byhim: Mary Magdalene, her sister Martha,and their brother Lazarus. Its creatorsreject the conventional “reformed prostitute”version of Mary Magdalene, consideringit a baseless identity foisted onher centuries after the fact. They presentinstead a woman of rich emotional complexity,a psychically damaged womanwhose turbulent inner life and hard pastgo hand in hand with her deep powers of intuition and volatile sensuality. She is, in the words of the Rosario Castellanos poem Adams sets to music in Act I, “like a bird crucified in flight.” Her “otherness” is revealed in her troubled sense of alienation in the world: her wild mood swings from near manic joy to suicidal self-loathing, her seizures of bitter anger and her moments of tender compassion. Most of all, it is her “otherness” that fuels her hunger for self-knowledge, that “spiritual food” she gains from sitting at the feet of Jesus. Her sister Martha is the opposite of the restless, questing Mary. Emotionally stable, dependable, she is so reliable that she becomes literally “distracted with much serving” to the point of complaining to Jesus. It is Martha who cooks the food, manages the home, and shoulders the burdens of everyday life. But her grief when her brother dies and later when Jesus is executed is no less than that felt by Mary. Perhaps the most traditional aspect of The Gospel According to the Other Mary is its narrative “simultaneity,” its way of fusing the “mythic past” of the Gospels with vivid images from modern life – a strategy that remains deliberately provocative. This is a Passion story that begins with women who have been jailed for protesting on behalf of the poor. Martha not only feeds Jesus but she also helps run a house for unemployed women. In Act II the arrest and brutal treatment of Jesus stands side by side with a depiction of the arrest and abuse by the police of a group of striking women. For Adams and Sellars, this speed-of-light movement back and forth between the distant biblical past and the “loud and chaotic” present is nothing new. In their opera The Death of Klinghoffer, choral evocations of Old Testament and Koranic stories flow directly into violently graphic images of televised news events. Paintings of the Crucifixion, also from the medieval era, struck him for their vivid and graphic reportage. “So many are obviously set in a local town or village that mirrors the geography and setting of the artist. What you’re seeing are gruesome executions carried out in public spaces, while elsewhere in the painting people may be going about their daily lives, perhaps even unaware of the violence taking place.” The composer adds that, in the course of writing the piece, he gained “a glimmer of understanding of what it must have been like to be a medieval craftsman – whether you were working with woodcutting, stonecutting, painting, or book illumination – and literally to illuminate the tiniest detail.” A moment he singles out from The Other Mary is the final scene, in which Mary, after looking into the empty tomb, sees a man whom she assumes to be a gardener standing behind her. Only when he speaks to her a single word, “Mary,” does she realize he is the newly risen Jesus. The Other Mary pulsates with the energy of its sources, not only those from the Bible but from the polyphony of voices, most of them feminine, that make up the unique and unorthodox libretto crafted by Sellars. Texts drawn from the autobiography of Dorothy Day (1897–1980), the American social activist and leader of the Catholic Worker Movement, recount her revolutionary efforts to follow Jesus’ message of social justice. These frame the opening sections of both of The Other Mary’s two acts, which place Mary and Martha in the “eternal present” as they run a shelter for the destitute and later join César Chávez on the front lines of the United Farm Workers’ protest march. The explosive lyricism of African-American poet and essayist June Jordan (1936–2002) adds painful resonance to the women’s reflections during the scene of their brother Lazarus’ death. Another Erdrich poem, “Orozco’s Christ,” opens Act II in a chorus of blistering ferocity. Inspired by a terrifying image – by the Mexican muralist José Clemente Orozco (1883–1949) – of an angry Christ chopping down his own cross with an axe, it depicts an aggressive, militant Jesus. The fall of rain on the night of the Crucifixion, and the sound of frogs emerging from the earth in spring as an image of Resurrection are also from poems in Erdrich’s Baptism of Desire cycle. Texts (in Spanish and Latin) by Mexican poet Rosario Castellanos (1925–1974) and the 12th-century mystic and abbess Hildegard of Bingen – both of whom appear in El Niño’s libretto – further infuse feminine spirituality into powerful moments in the narrative. Other texts include a prayer by the early modernist poet Rubén Darío (1867–1916) and “Passover” by Italian writer-chemist (and Auschwitz survivor) Primo Levi (1919–1987), whose words of forgiveness, celebration, and hope Adams gives to the grateful Lazarus in the closing moments of Act I. The first act plunges us immediately into the scene of Mary and Martha’s activist work in Bethany, where Jesus joins them. The absence of an architectonic opening chorus is an unusual strategy for Adams. Mary experiences a more tormented inner life and is sensitive to the world’s disorder, while Martha focuses her vision on a practical call to action. Serving as the act’s fulcrum are the sickness, death, and resurrection of their brother Lazarus, which Sellars envisions as a “rehearsal” staged by Jesus in anticipation of his own return from the dead. Jesus’ arrest (with which, for example, Bach’s St. John Passion begins) occurs at the beginning of the second act. The scene of the Crucifixion at the act’s center, notes Adams, “needed a lot of time and space” and is thus portrayed in the most-extended section of the work ( the combined scenes 3 and 4, “Golgotha” and “Night”). And while Passion settings typically end with the burial of Jesus, The Other Mary reaches forward to the Resurrection in its openended final scene. During the process of composing the work, recalls Adams, current events seemed to reinforce biblical parallels all too vividly – in increasingly acceptable and widespread attitudes of “malice towards the weak and poor,” and in the resurgence of violence against women across the globe, from beatings to intimidate participants in the Arab Spring uprisings to the recent denigration of women by American talk-show demagogues. Myriad aspects of El Niño are mirrored in The Other Mary’s libretto and score – some of them unintentional or perhaps intuitive. 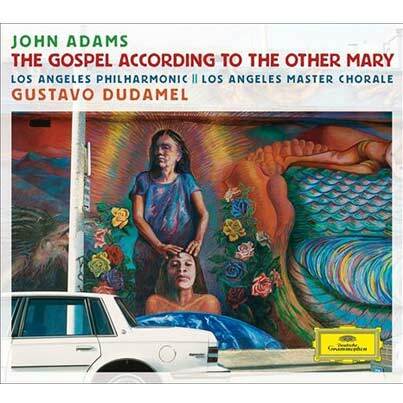 The use of the trio of countertenors in general is a clearly designed link between the two oratorios, yet Adams shades their formerly angelic harmonies with a darker, at times even bitter sound. In the Golgotha scene, when they repeatedly voice Jesus’ words “Mother, behold thy son,” listeners familiar with El Niño might detect an aching echo of their exuberant phrase depicting the pregnant Mary (“the babe leapt in her womb”). The orchestra itself becomes a character, or perhaps an omniscient narrator – particularly in the passages portraying Lazarus’ death and resurrection, the terror and suffering of Golgotha, with its mocking crowds and thickening darkness, and the “ravenous trill” of reawakened spring that provides a radiant transition into the concluding scene. As Mary perceives the gardener’s identity in a flash of recognition, Adams’ music helps us, too, share in her spiritual transformation. 8	Why standest thou afar off, Lord? 10	Don t touch my left arm! 20	Tell me: How is this night different from all other night? 17	Why seek ye the living among the dead?